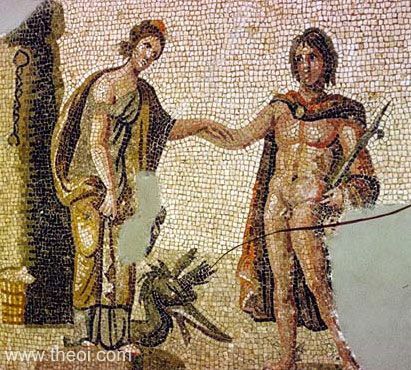 The hero Perseus liberates Andromeda from her chains after slaying the Cetus (Sea-Monster). The hero wears a red cloak and holds a hooked sword and the head of the Gorgon Medusa in one hand. The monster is depicted as a draconic sea-serpent lying at the feet of Andromeda.